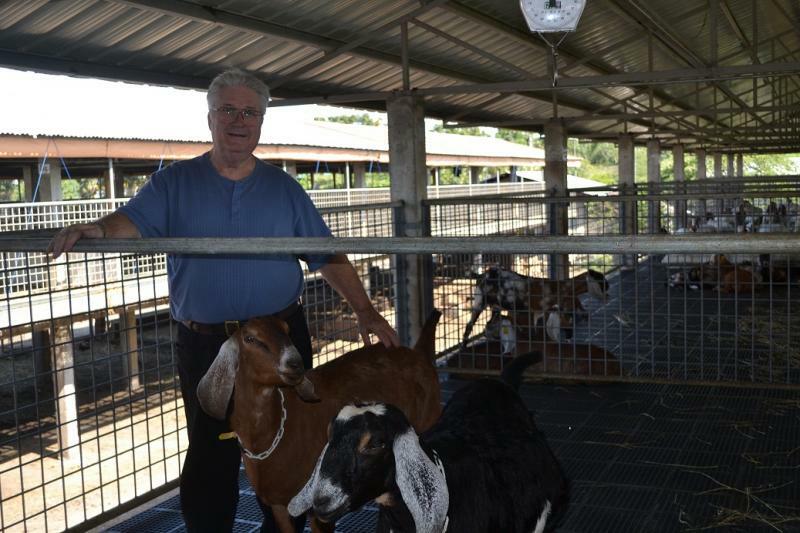 GODDARD FARM IS PROUD TO ANNOUNCE SHIPMENT OF THREE MATURE DOES TO THE REPUBLIC OF THE PHILIPPINES ON OCTOBER 29, 2011. 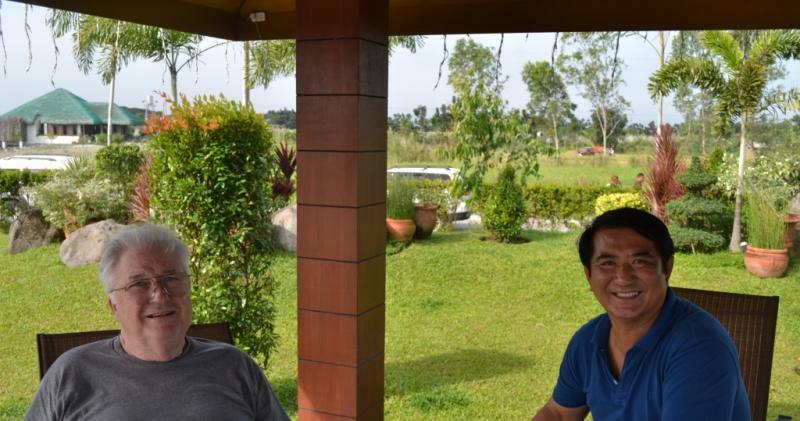 WE HAD THE OPPORTUNITY TO VISIT AND GET ACQUAINTED WITH MR. JOMAR HIZON, THE HONORABLE MAYOR OF BACOLOR, PAMPANGA, AND MEMBERS OF HIS FAMILY WHEN THEY WERE HERE AT OUR FARM IN SEPTEMBER. THEY WERE DELIGHTEFUL PEOPLE TO DO BUSINESS WITH AND THE ENTIRE EXPORT TRANSACTION WENT SMOOTHLY. 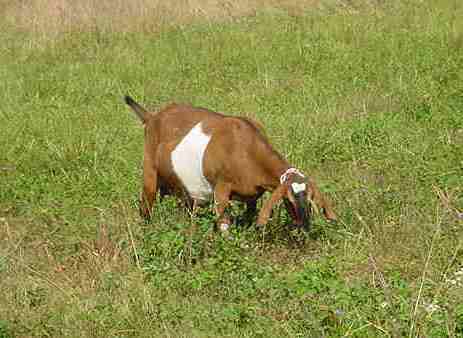 All export animals are isolated in a USDA-aphis approved area of our farm where they are tested negative for T.B., Brucellosis, Bluetongue, Q. 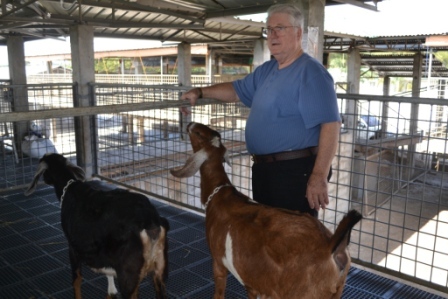 Fever, Johnes, Maedi-visna (MV) Caprine Arthritis (CAE) and vaccinated for contagious pustular dermatitis (sore mouth) during the 30 days preceeding shipment pursuant to the stringent requiremetns of the Philippines. Our herd has been certified Brucellosis free, accredited T.B. free by annual whole herd blood test since 1992, and G6S Normal by DNA or parentage since 2000. MY GOOD FRIEND JOMAR HIZON IS THE MAYOR OF BACOLOR, PAMPANGA PROVINCE. PART OF HIS MAYORAL RESPONSIBILITIES ARE TO PERFORM WEDDINGS. AFTER PERFORMING THE CEREMONY FOR THESE TWO YOUNG COUPLES I WAS INVITED TO BE IN SOME OF THE PICTURES. THIS WAS ONE OF THE MANY INSPIRING EVENTS DURING MY WONDERFUL VISIT TO THE PHILIPPINES DURING JANUARY 22 - FEBRUARY 1 - 2012. 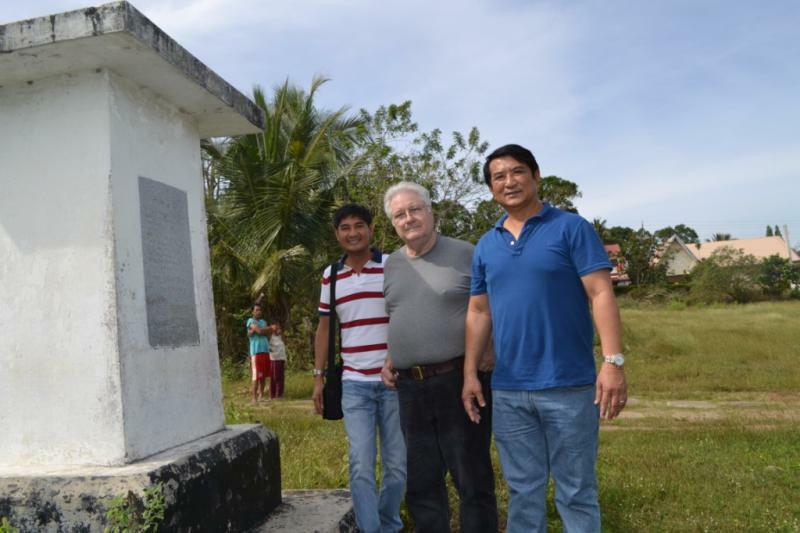 LEFT TO RIGHT, DARIUS HIZON, NOAH, JOMAR HIZON, AT THE WORLD WAR II MEMORIAL MARKER IN THE MUNICIPALITY OF PILAR, PROVINCE OF BATAAN, REPUBLIC OF THE PHILIPPINES. THIS IS THE LOCATION WHERE THE INFAMOUS DEATH MARCH BEGAN ON APRIL 9TH., 1942, AFTER PHILIPPINE AND AMERICAN FORCES, HELD OUT FOR 6 MONTHS AGAINST OVERWHELMING ODDS OF HEAT AND HUMIDITY, STARVATION, DISEASE, AND LOW SUPPLIES OF FOOD & AMMUNITION, WERE CAPTURED BY THE JAPANESE AND MARCHED WITHOUT FOOD OR WATER FOR 6 DAYS TO A PRISON CAMP FARTHER INLAND. 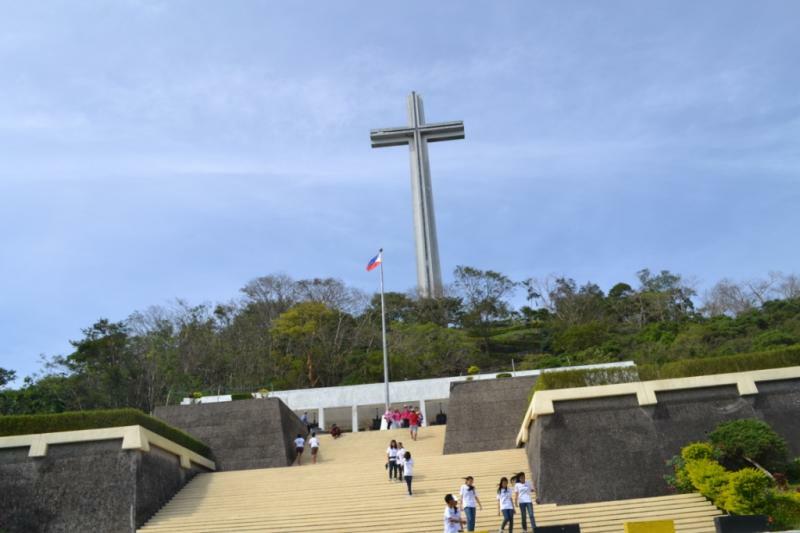 Allied forces used Mount Samat during the defense of Bataan in early 1942, and were bombarded by Japanese artillery from Balanga. 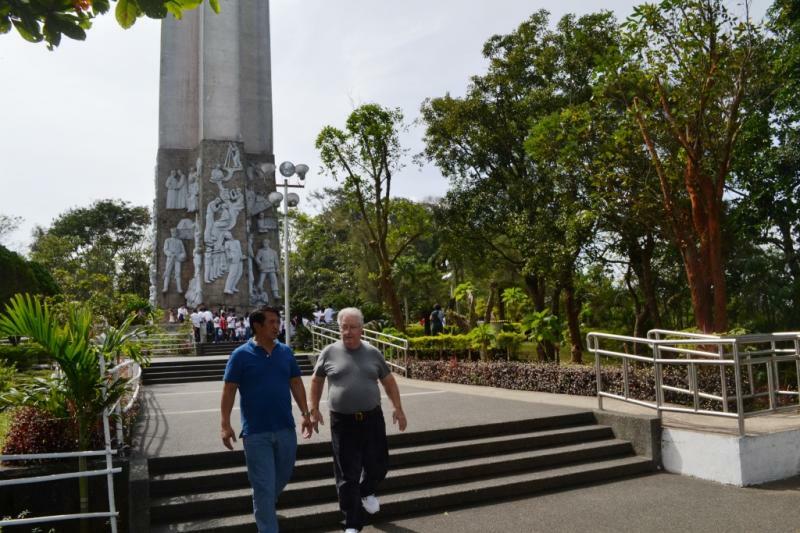 The memorial is located at Diwa, Pilar, Province of Bataan, at the end of a well-marked road off Governor Linao Highway, 7.7 km west of the junction with the Roman highway. Open Daily 8 a.m. to 9 p.m. 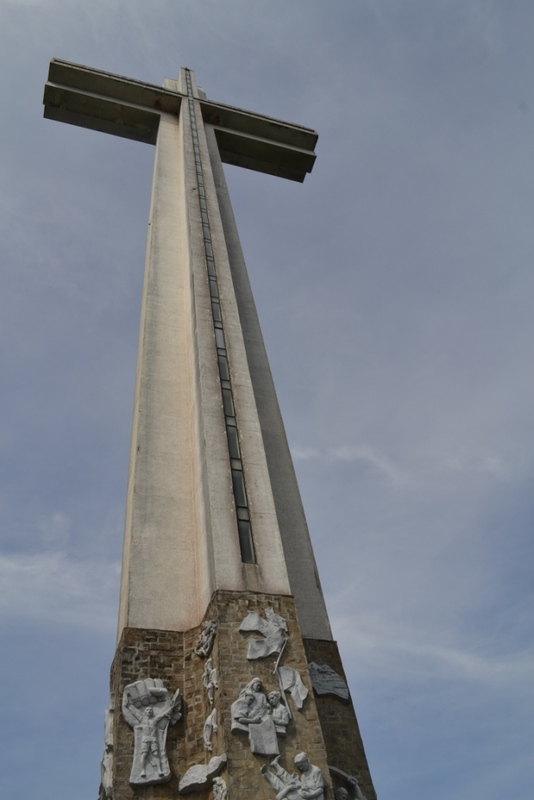 This memorial is a 300 foot tall cross. An elevator goes to the top viewing gallery with sweeping views and a memorial depicting the battle. In Diwa, municipality of Pilar, Bataan, up on Mt. Samat, is the Shrine of Valor or Dambana ng Kagitingan. A great place to visit if you want to learn more about Bataan's role in the defense of the Philippines during WWII. Shown in this picture is a portion of the cross monument base. Relief sculptures surround the base of the cross depicting various events & figures in Philippine history. My Filipino hosts easily recognized the scenes and personages depicted and explained the significance of the sculptures. There were several school bus loads of high school students and a number of tourists visiting the memorial while we were there. INCLUDED BELOW ARE PICTURES OF THE DOES THAT WERE SENT TO THEIR NEW OWNERS IN THE PHILIPPINES. THE DOES ARE NOW LONG YEARLINGS BRED FOR 2012 SPRING FRESHENING AND ADDITIONAL PICTURES WILL BE ADDED AS THEY ARE AVAILABLE. GODDARD FARM AMBER IS SHOWN ABOVE AS A WEANLING AT ABOUT THREE WEEKS OF AGE, BORN MARCH 01 - 2010. AMBER WAS ONE OF THE EXPORT DOES. 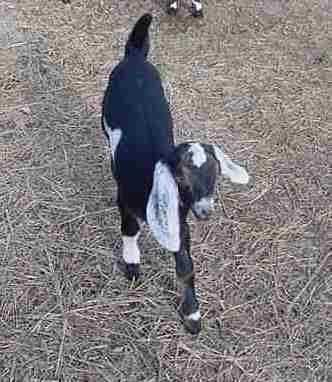 AMBER IS A DAUGHTER OF GODDARD FARM ELECTRA, 4*M, AND WAS SIRED BY ONE OF OUR SENIOR HERD SIRES, *B PRAIRIE ACRES DENALI. 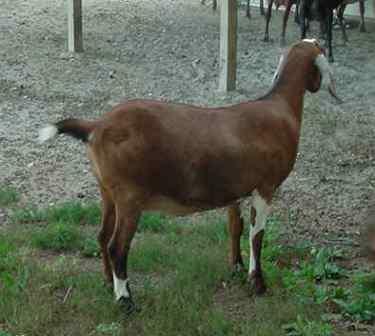 AMBER IS BRED TO *B GODDARD FARM El PODEROSO FOR SPRING 2012 KIDDING. 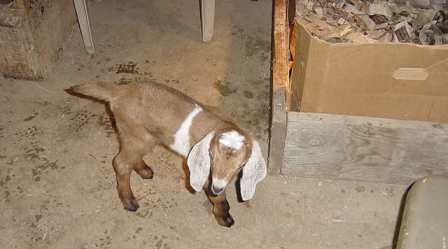 BLUE BERRY, IS THE 2-YEAR-OLD RED DOE WITH FROSTED EARS, IN THE ABOVE PICTURE ON THE LEFT. 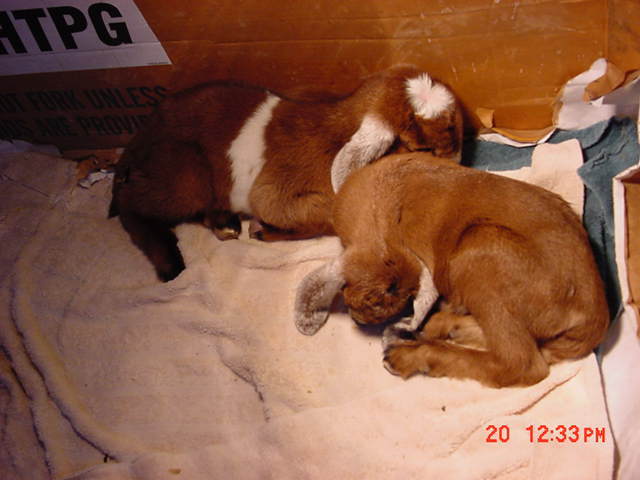 ANOTHER ONE OF THE EXPORTS, GODDARD FARM DESIDERATA IS THE BROWN DOE IN THE FOREGROUND WITH THE BROWN DOT IN THE MIDDLE OF HER WHITE SPLASH, BORN MARCH 26 - 2010. 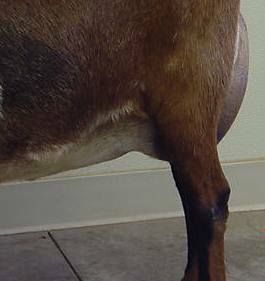 DESIDERATA IS ONE OF JULIA'S QUADS. THIS PICTURE WAS TAKEN APRIL 11 - 2010. DESIDERATA IS ALSO BRED TO El PODEROSO FOR SPRING 2012 KIDDING. GODDARD FARM DESIDERATA IS SHOWN AS A LONG YEARLING IN THE PICTURE ABOVE TAKEN JULY 17 - 2011. THIS IS A PICTURE OF GODDARD FARM JULIA'S CORRECT AND WELL-ATTACHED UDDER. WE EXPECT HER DAUGHTER DESIDERATA TO FRESHEN WITH THE SAME UDDER AND MILK PRODUCTION. 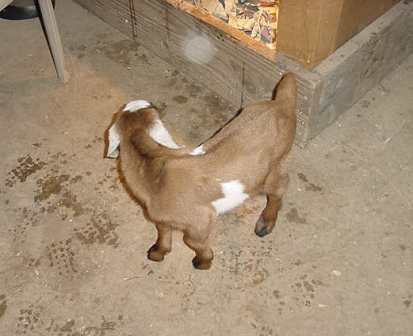 THE THIRD EXPORT DOE, GODDARD FARM BLUE BERRY, IS SHOWN IN THE PICTURE ABOVE IN THE NURSERY AT ONE DAY OF AGE, BORN FEBRUARY 19 -2010. 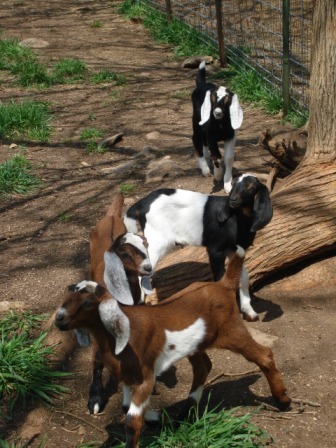 BLUE BERRY IS THE DOE KID WITH THE DARKER COLOR WITH WHITE CROWN AND EARS AND WHITE BAND. THE TWO PICTURES ABOVE ARE OF GODDARD FARM BLUE BERRY, BORN TO ONE OF OUR ADGA TOP TEN MILKERS, GODDARD FARM RASPBERRY, 3*M. BLUE BERRY HAS GROWN INTO A LOVELY DOE AND WILL BE A GREAT MILKER. BLUE BERRY AND El PODEROSO ARE BOTH OUT OF GODDARD FARM RASPBERRY 3*M, OUR MOST POWERFUL DAIRY DOE.